HOUSTON -- The Texas Rangers' trade deadline-day moves bought them a victory Saturday night. Jonathan Lucroy hit two homers, Carlos Beltran had a tiebreaking single and three hits and the Rangers beat the Houston Astros 3-2. Lucroy, Beltran and reliever Jeremy Jeffress were acquired before the trade deadline by the Rangers, and Lucroy hit his first homer with Texas in a 5-3 win Thursday. "They've shown up huge for us, all three of them," manager Jeff Banister said. "Jeffress with the two innings he's thrown for us so far, Lucroy with what you see behind the plate, it's All-Star caliber. Frontline caliber. And then at the plate the two home runs tonight, the home run the other night and just the quality of at-bats. And then a future Hall of Famer in my opinion in Beltran. Just as good a hitter as there is in the game." Lucroy got his second home run in the eighth off Tony Sipp for his seventh career multihomer game and first this season. "Playing meaningful games is always a lot of fun," Lucroy said. "This is my third season I've been that I've actually played for a team that's really competing. It's really cool and it's a lot of fun out there. Makes it easier to play, makes it easier to get us more excited. Just a whole different feeling." Keone Kela (2-1) pitched a perfect sixth inning for the win. Sam Dyson ran into trouble in the ninth, giving up an RBI single to Alex Bregman, but induced a game-ending groundout from Marwin Gonzalez to get his 24th save. Lucas Harrell gave up one run and walked five in 3 2/3 innings, matching his shortest outing of the season. The run came in the first inning when Preston Tucker walked with the bases loaded. Houston left seven runners on base through the first three innings against Harrell. "Certainly on our end we had a chance in the first," Astros manager A.J. Hinch said. "... Chance in the second, chance in the third, chance in the fifth, chance in the ninth. That's a lot of innings to come away with a couple one-run innings. Credit to their guys for walking the fine line, but certainly, we felt like we could have gotten more out of tonight." 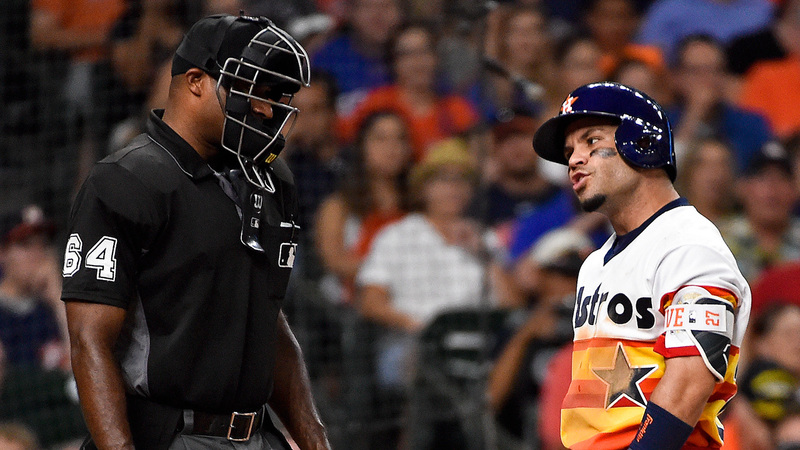 Jose Altuve was ejected in the seventh for arguing with plate umpire Alan Porter. This is the first time Altuve has been ejected in his career. Doug Fister gave up one run on nine hits, walked two and struck out two in six innings. Fister has allowed three runs or fewer in 18 of his 22 starts. Bregman got the first three-hit game of his career with two singles and a double and got his first RBI. Bregman is 5 for 43 since making his debut. Houston commemorated the 30th anniversary of the 1986 NL West division champion team, including Nolan Ryan, Jose Cruz, Phil Garner and Alan Ashby. The Astros wore their rainbow pullover jerseys that the 1986 team wore. The 1986 NL Cy Young Award winner Mike Scott threw out the ceremonial first pitch to Dallas Keuchel. Rangers: LHP Derek Holland (left shoulder inflammation) gave no indication of soreness, tightness or feeling bad following his first rehab assignment start with Triple-A Round Rock on Friday, manager Jeff Bannister said. Rangers: RHP Yu Darvish (2-3, 3.29 ERA) starts against Houston on Sunday. Darvish is 0-4 since the All-Star break despite posting a 3.57 ERA in that span. Astros: RHP Joe Musgrove (0-0) makes his first major league start on Sunday against Texas. Musgrove struck out eight batters in 4 1/3 shutout innings of relief in his debut on Tuesday against the Toronto Blue Jays.